Determining soil salinity within the delta is crucial as it is the dominant factor determining crop productivity. There are numerous interacting drivers that influence soil salinity, including climate variability, saline river water inundation, storm surge inundation, depth to groundwater table, groundwater salinity, and shrimp farming (Bagda). For the study area, tidal river salinity appears to influence the soil salinity most, particularly in the south-west of the delta. In northern areas, high groundwater salinity levels, combined with a high groundwater table, are a major contributor to soil salinity. In addition, an increase in salinity of dry season irrigation water is expected to increase salt accumulation in soils, with a possibility of irrigation water salinity exceeding five parts per thousand. 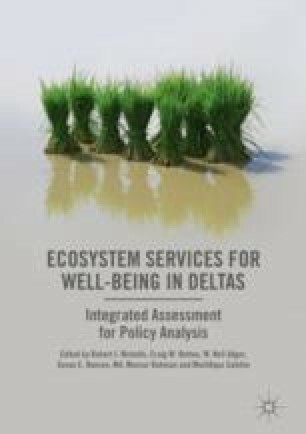 The coastal area of Bangladesh covers about one-fifth of the country and represents more than 30 percent of the country’s cultivable lands (Rasel et al. 2013). Livelihoods in this region are thus largely dependent on agricultural practices; however, dry season agricultural productivity in this region is low compared to the national average (see Chap. 24), which is considered to be one of the major reasons for high incidence of poverty (Lázár et al. 2015). Soil salinity is the dominant factor behind the low crop productivity, which is further compounded by inappropriate and/or faulty water control structures in some areas. 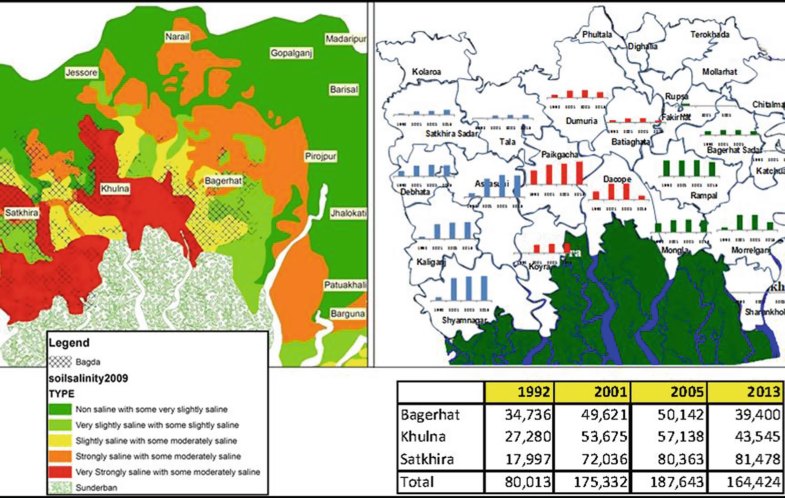 A total of 1.05 million hectares of land out of 2.88 million hectares in the Khulna and Barisal divisions are affected by different degrees of soil salinity within the coastal and offshore lands (SRDI 2010) (Fig. 18.1). The spatial pattern of soil salinity is similar to that of river water salinity (Fig. 18.2) and groundwater salinity (Fig. 18.3). Large areas of land remain fallow in the dry season (January–May) because of soil salinity, lack of good quality irrigation water, and problems with water control (mostly drainage) (Mondal et al. 2006; SRDI 2010). The coverage of dry season irrigated Boro crop within the study area (29.3 percent) is much lower than the national average of around 63 percent. With poor dry season surface water resources, groundwater is the primary source of irrigation water in many areas. However, shallow aquifers in most of the south-west coastal region are affected by different levels of salinity due to seawater intrusion and interaction with saline surface water (Fig. 18.3). This has resulted in the extraction of groundwater from deeper aquifers using tube wells . There has been a progressive increase in soil salinity in terms of intensity, and affected area over the last four decades with saline areas increasing from 0.83 million hectares in 1973 to about 1.05 million hectares in 2009 (SRDI 2010). There was an increase in affected area by 0.19 million hectares from 1973 to 2000 and a further increase by 0.04 million hectares from 2000 to 2009 (SRDI 2010). 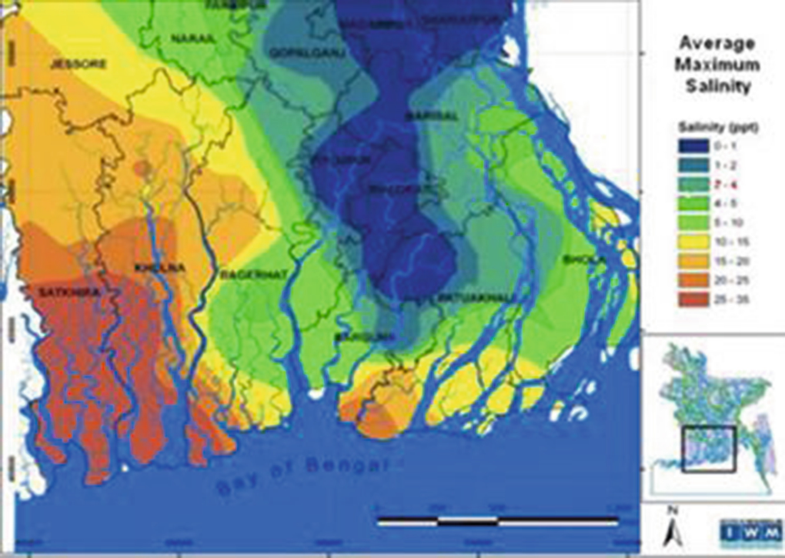 There are numerous interacting drivers that influence soil salinity in Bangladesh (Table 18.1) including irregular rainfall, evaporation, saline river water inundation in both unprotected and protected areas (polders ), depth to and salinity of groundwater, irrigation using saline water, storm surge inundation, and brackish shrimp farming (SRDI 2010; Rashid and Islam 2007; Haque et al. 2008; Rasel et al. 2013). As these factors vary spatially in the south-west coastal region, their relative effects on soil salinity are also spatially variable and complex. Seasonal variation in soil salinity is quite distinct; top soil salinity gradually increases from January, reaches a maximum usually in April or May, and then starts to gradually decrease with the onset of monsoon and reaches the seasonal low usually in September or October when salts are sufficiently flushed out by monsoon rainfall. However, at some places greater accumulation of salts occurs due to a combination of the factors listed in Table 18.1. Capillary rise causes salt accumulation from shallow groundwater which commonly occurs in irrigated areas in the dry Rabi season (Brammer 2014). Once the water table reaches a critical depth below the ground surface, evaporation of this water can occur via capillary rise, transporting soluble salts with it to the active root zone and top soil surface (Beltrán 1999; Ayers and Westcot 1994; Gupta and Khosla 1996). The critical depth may vary from 1 m in coarse textured soil to a few meters in fine textured soils (Gupta and Khosla 1996). Two important considerations thus are the following: at what depth is the groundwater and how saline is the groundwater? Depth of groundwater can be influenced by increased sea level in the future thus contributing to increased salt accumulation in the soil. Groundwater salinity is anticipated to be negatively impacted by lateral seawater intrusion due to accelerated sea-level rise, increased river salinity resulting from reduction of river flows and sea-level rise, and prolonged inundation induced by cyclonic storm surges. Figure 18.4 shows that in dry season (January–May), the depth to groundwater is within 0–1.5 m in many places in the eastern part of the region. In the monsoon season (July–November), the water table becomes shallow in most regions, but the key difference is that the shallow groundwater is primarily fresh rainwater. Murshid (2012) indicated that groundwater pumping from shallow wells less than 200 m from a polder boundary can induce an inflow of brackish water under the polder and into the irrigation well. Additionally, groundwater salinity is anticipated to be negatively impacted by rising sea level and subsidence which would push the seawater interface further inland. This would be exacerbated by an increase in river salinity due to reduction in river flows. There are major river channels along with numerous small rivers and estuarine/tidal creeks that carry saline water from the sea to interior lands in the dry season due to tidal exchange (see Chap. 17). The coastal land elevation is typically between 0.9 and 2.1 m above mean sea level (Iftekhar and Islam 2004; Haque 2006). Tide or surges can rise up to 1.3 m above the general ground level in the dry season and can inundate wide areas (Rasel et al. 2013). Tides and surges of brackish sea water (19–28 parts per thousand (ppt)) can propagate up to 200 km inland in times of reduced river discharge (Mondal et al. 2006; Dasgupta et al. 2014). Inundation can also take place inside the polders through embankment breaches or due to poor management of the outlet gates and via seepage through soils or embankments. This mechanism is exacerbated by reduced dry reason river flows. Fresh water diversions from the river Ganges has meant river flows into the western part of the south-west coastal zone is substantially reduced in the dry season. This results in high river water salinity in and around Satkhira, Khulna, and Bagerhat districts. In contrast, in the eastern area, fresh water delivery by the Padma and Lower Meghna rivers means that salinity is concentrated nearer the coast (Fig. 18.2). There is a strong association between river water salinity and soil salinity in the eastern part (Satkhira, Khulna, and Bagerhat districts) and southernmost regions of Barguna, Patuakhali, and Bhola districts (Fig. 18.5). However, a more detailed analysis shows that the association is weaker further inland from the sea where river salinity is lower, yet soil salinity remains high. This implies that factors other than river salinity also play important roles in determining soil salinity. A multiple regression analysis shows that soil salinity can be strongly related to depth to the groundwater table and rainfall in the dry season as well as river water salinity. The fact that river water salinity plays a dominant role in controlling soil salinity has significant implications. A probable future scenario for this region comprises reduced dry season river flows (caused by climatic change and increased damming and diversion upstream) and accelerated relative sea-level rise (caused by global sea-level rise, subsidence and reduced sediment delivery due to river damming), and the soil salinity problem is expected to further intensify and extend over wider areas (see Chap. 17). Cyclonic storm surges have been another cause of increase in soil salinity in the surge affected areas in Bangladesh (see Chap. 8). The impacts are frequently prolonged for several years. For example, Cyclone Aila (2007) inundated large areas in Dacope Upazila of Khulna district via overtopping of polders and breaches in the embankments. As rehabilitation of the polder dykes was slow, the tidal floodplain areas were repeatedly inundated by saline tidal water for one to two years, with saline water trapped in low-lying areas with silted up drainage canals. It took two to three monsoons to flush out the accumulated salts before agriculture could be partially restored, which caused prolonged suffering to the local people whose livelihoods are intertwined with agriculture (Kabir et al. 2015). Clarke et al. (2015) showed that accumulation of salts on the agricultural land in the dry season is controlled by the amount and quality of irrigation water applied. An increase in the salinity of sources of dry season irrigation water will lead to increased salt accumulation in soils. Other key factors were the effectiveness of the monsoon rainfall in removing water by leaching/disposal through effective and well-maintained drainage systems. Their analysis showed that irrigating with water at up to four parts per thousand (ppt) can be sustainable, but if the dry season irrigation water quality goes above 5 ppt, the monsoon rainfall is unable to flush out the salt deposits. It was found that agricultural productivity in the Barisal, Patuakhali, and Bhola districts is likely to fall by 25 percent by 2050, with some regions expected to experience dry season crop yield reductions of 50 percent. 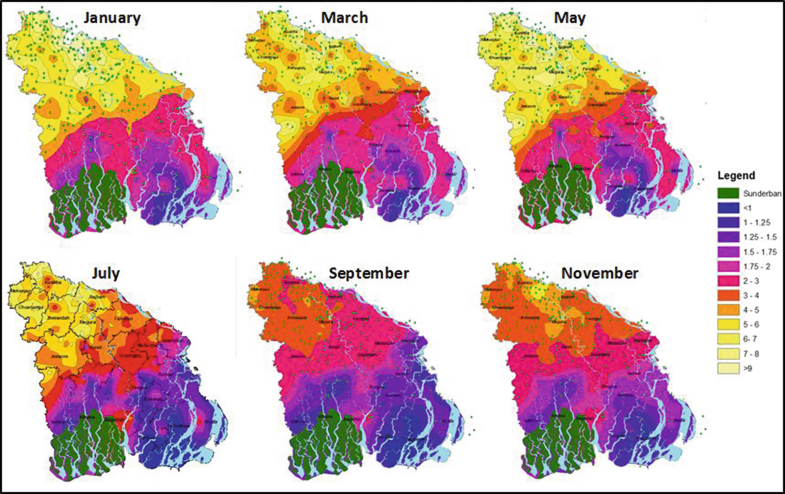 Regions which are already experiencing severe salinity in Barisal and Khulna divisions are expected to see salinities of greater than 20 ppt by the end of the century, effectively curtailing dry season agriculture (Fig. 18.6). Shrimp farming is the third largest earner of foreign currency, with production primarily based in southern regions around Satkhira, Khulna, and Bagerhat (Begum and Alam 2002). Shrimp culture is one of the most attractive land use practices as the profits generated exceed those of traditional agriculture (Hossain et al. 2004). However, shrimp culture has not been free from its negative effects, especially with the brackish shrimp (locally known as Bagda) culture. There has been a rapid growth of Bagda over more than two decades in the southern part of the coastal region by taking advantage of high river water salinity (Fig. 18.7) (see Chap. 20). Extensive shrimp ponds (ghers) were constructed with saline water brought from surrounding rivers via canals. Unfortunately, this kind of shrimp culture has led to the deterioration of coastal soils and ground/surface water sources through increased salinization (Rahman et al. 2013; Kabir and Eva 2014; Karim et al. 1990). Brackish shrimp culture concentrates in the saline areas where soil salinity is principally impacted by river water salinity in the dry season. 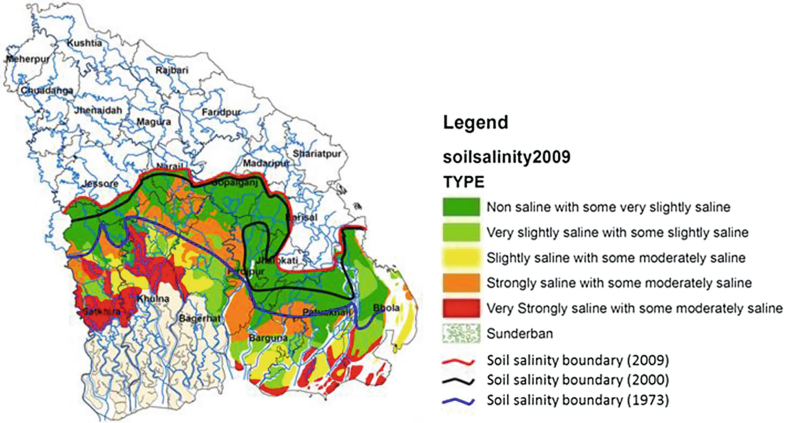 Soil salinity is a major constraint of agricultural production and human livelihoods in the coastal region of south-west Bangladesh, but there are multiple relationships between groundwater salinity, surface water salinity, human management (or mismanagement) of water resources, and the resulting accumulation of salts in the soils of the farmlands. When considering future trajectories of environmental change, it will be vital to assess the interactions between the drivers of soil salinity and to be aware of the interactions between surface water and groundwater. Increases in river and groundwater salinity will have significant future implications given their important roles in affecting salt accumulation in soil. River salinity may increase due to accelerated sea-level rise and reduction of dry season river flows. Groundwater is closely linked to the surface hydrology, and it cannot be assumed to be independent of external factors and environmental change. Aquifer water quality can be affected by lateral seawater intrusion due to accelerated sea-level rise, increased river salinity being exchanged with shallow groundwater, cyclonic storm surges, human activities such as groundwater pumping, and deliberate inundation of farmland for brackish aquaculture. Strategic water plans must take note that poor management of surface water and groundwater resource use may result in a long-term degradation of soil quality which will be difficult to reverse. Ayers, R.S., and D.W. Westcot. 1994. Water quality for agriculture. FAO irrigation and drainage paper 29. Rome: Food and Agriculture Organisation (FAO). http://www.fao.org/docrep/003/T0234E/T0234E00.htm. Accessed 22 May 2017. Begum, A., and S.M.N. Alam. 2002. 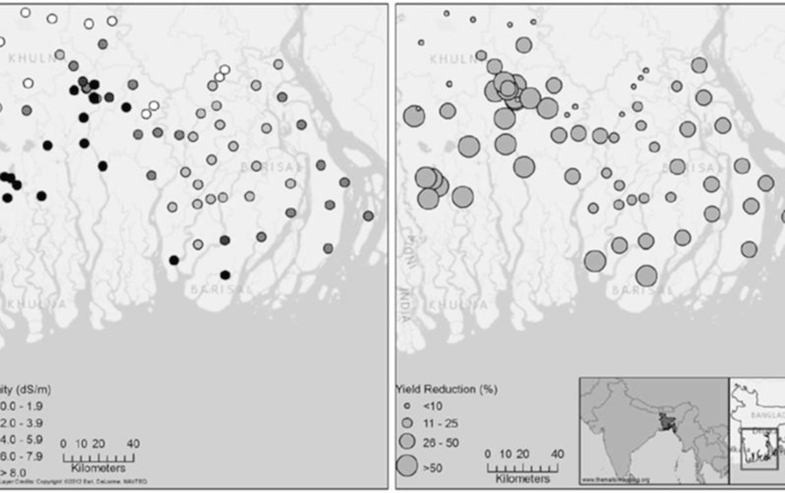 Social and economic impacts of shrimp disease among small-scale, coastal farmers and communities in Bangladesh. Primary aquatic animal health care in rural, small-scale, aquaculture development. Rome: Food and Agriculture Organisation (FAO). http://www.fao.org/docrep/005/Y3610E/y3610E18.htm. Accessed 27 Apr 2017. Dasgupta, S., F.A. Kamal, Z.H. Khan, S. Choudhury, and A. Nishat. 2014. River salinity and climate change: Evidence from coastal Bangladesh. Policy working paper series 6817. Washington, DC: The World Bank. 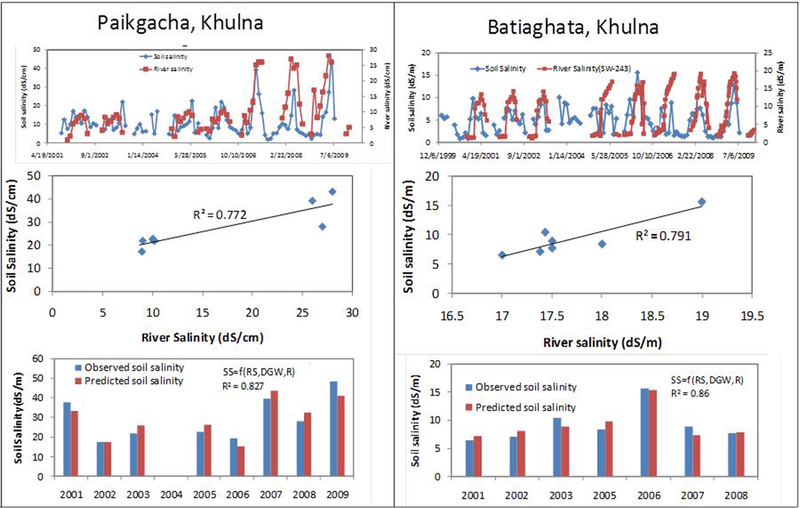 http://documents.worldbank.org/curated/en/522091468209055387/River-salinity-and-climate-change-evidence-from-coastal-Bangladesh. Accessed 11 Apr 2014. Hossain, S., S.M.N. Alam, C.K. Lin, H. Demaine, Y. Sharif, A. Khan, N.G. Das, and M.A. Rouf. 2004. Integrated management approach for shrimp culture development in the coastal environment of Bangladesh. World Aquaculture, World Aquaculture Society, Louisiana State University, Baton Rouge. 35–44. https://www.was.org/Magazine/Contents.aspx?Id=8. Accessed 22 May 2017. Murshid, S.M. 2012. 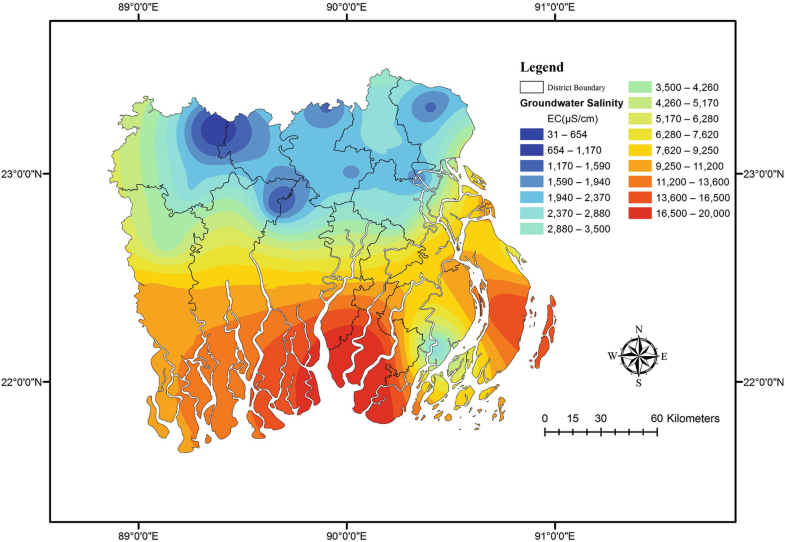 Impact of sea level rise on agriculture using groundwater in Bangladesh. MSc thesis CoMEM programme, University of Southampton. https://repository.tudelft.nl/islandora/object/uuid:e484b9b8-e1d1-40b1-99ee-5c7a274ef500/?collection=research. Accessed 22 May 2017.